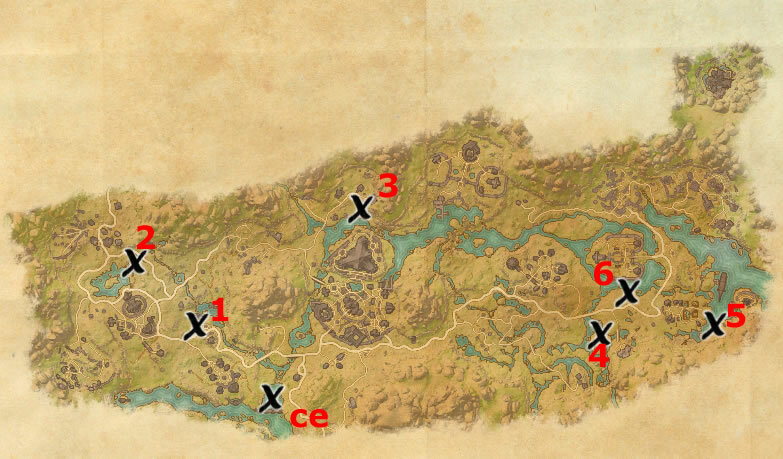 Treasure Map II – 18×48 – From Obsidian Gorge Wayshrine head west towards the lake Hlaalu, turn left before the bridge, it is between two big trees. Treasure Map III – 46×41 – East from Mzithumz Wayshrine. Treasure Map IV – 76×57 – West from Muth Gnarr Hills Wayshrine. Treasure Map V – 90×55 – West of Smuggler’s Slip. Treasure Map VI – 80×51 – On a small island. Collector’s Edition Map – 46×41 – Next to a tree in a shallow lake just outside the city.